Africa Logistics Properties (ALP) has begun construction of Kenya’s first modern grade-A logistics and distribution warehousing complex at Tatu Industrial Park. The facility, which will offer a total floor space of 50,000 sqm in three units, will be the largest warehouse in Kenya to be built to international standards and available to the rental occupier market. 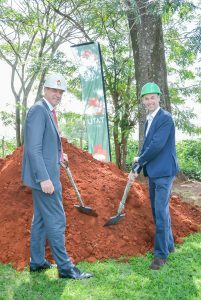 Speaking during the ground-breaking ceremony at Tatu Industrial Park, ALP CEO Toby Selman outlined the expected impact of the project and potential opportunities it presents for Kenya. 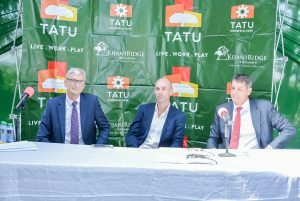 “Our distribution and logistics centre at Tatu Industrial Park offers international standard modern facilities for the rental market, and we plan on rolling out similar world-class developments across key African capital cities. Our vision is to fundamentally improve supply chain infrastructure across Africa and disrupt the current status quo of poor quality ‘go down’ warehousing. As we start construction on our first two projects in Kenya, we are already building a pipeline of future projects across Sub-Saharan and North African cities to create the continent’s future industrial hubs,” he said. The project, which is supported by a range of global institutional shareholders such as the International Finance Corporation, CDC Group, Africa-focused UK asset manager Mbuyu Capital, DOB Equity and Maris, will see more than 200 people benefit from employment opportunities during construction and up to 500 more people permanently employed once construction is completed. ALP’s management team have more than 40 years’ combined real estate investment track record in the industrial and logistics sector, having completed over $2bn of modern warehousing park developments in emerging markets. Tatu Industrial Park comprises of 457 acres of serviced land suitable for non-polluting light industrial, assembly, warehouse and logistic uses. It is ideally located for local, regional and international companies expanding in Africa through a hub in Kenya. Other companies at Tatu Industrial Park include Chandaria, Dormans Coffee, Unilever, Kim-Fay and Maxam.